In the very earliest breath of spring, a hidden journey begins in the woods. As temperatures warm during the day, sap stored in the roots of the trees begins to flow, nourishing the buds that will soon announce themselves in the welcome green of spring. As operators of Funks Grove Pure Maple Sirup Farm in Shirley, Illinois, Mike and Debby Funk, along with nephew Sean Funk, are part of a family tradition that brings that sweetness from the tree to your table. “Sirup” is the family’s preferred spelling for the farm (see below). Syrup season in central Illinois depends on the whims of Mother Nature but typically begins in mid-February or March, lasting from four to six weeks. Using about 7,000 spouts, or “taps,” the Funks draw sap from 3,000 sugar maple trees. 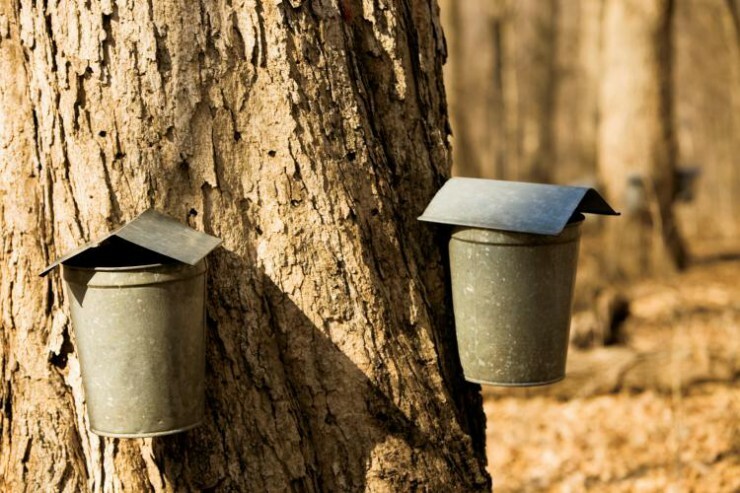 Tapping does not hurt the trees – in fact, the same stand of sugar maple trees at Funk’s Grove has generously shared its sap with the family for generations. The sap is collected in buckets hanging from the spouts or, increasingly, with plastic tubing and vacuum pumps. Sap consists primarily of water and is only slightly sweet when it’s first harvested from the tree. In fact, it takes up to 50 gallons of sap to make just one gallon of syrup. The sap is boiled to remove the water – a process that gives the colorless liquid the familiar amber color we love to pour over pancakes and waffles. “Heat caramelizes the sugar in the sap and turns it darker,” Debby explains. While it is hot, the syrup is filtered and bottled – up to 1,800 gallons of savory maple syrup each season. It’s a routine the Funk family has embraced year after year. When Isaac Funk first settled in the area in 1824, he made maple syrup primarily for his own use. But in 1891, his grandson, Arthur Funk, branched out and began selling syrup for $1 a gallon. This family tradition is also a true American tradition – one that has changed little over hundreds of years. “Native Americans used basically the same process we do, though advances in technology have made it a little easier and faster,” Mike says. Even with the benefit of modern technology, this is one family tradition that will test your mettle. Harsh weather conditions and time pressure make for a demanding season, which inevitably includes a few all-night boiling sessions. “Because the sap is perishable, the quicker you process it, the better syrup you’ll make,” Mike says. Her body may have tired of the work, but her taste buds have not tired of the end result. Glaida fondly recalls memories of dipping biscuits in homemade maple syrup around the family dinner table. “We’re pretty spoiled,” she says. And neither do their customers. Sirup made in Funks Grove has been shipped to every state, and as far away as Japan and Sweden. This local product has found fans far and wide, thanks to the farm’s prime location along that classic American roadway: Route 66. Along with their pure maple syrup, the Funks sell tempting treats such as truffles and maple cream candies. For more information, visit their website or call (309) 874-3360. Sirup is usually available at Funks Grove between March and August. Why ‘Sirup’ Instead of ‘Syrup’? No need to get your dictionary out – the Funk family spells “sirup” that way on purpose. This less conventional spelling is a tribute to Hazel Funk Holmes, who operated the syrup farm in the 1920s and ’30s. Holmes placed Funk family timber and farm land in a trust to ensure that future generations could continue to enjoy syrup made in Funks Grove. In that trust, she expressed her wish that “sirup” be spelled with an “i.” At the time, this was Webster’s preferred spelling to refer to pure syrup, made with no added sugar. In any case, the Funks know that “sirup” by any spelling tastes as sweet. For information about buying Funk’s sirup, you can call (309) 874-3360 or you can visit the farm’s website http://www.funksmaplesirup.com. On that site, you’ll also find an email address: info@funkspuremaplesirup.com. Call them or email them and I’m sure they’d be more than happy to help out. Hope this helps! do the trees still bud.